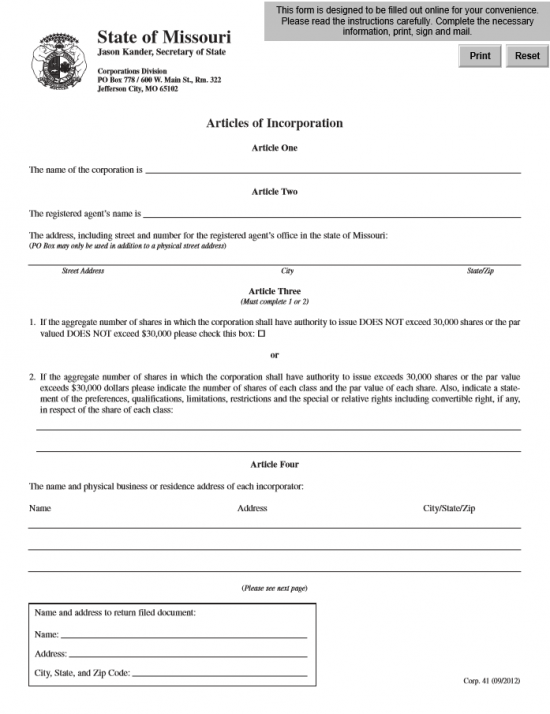 The Missouri Articles of Incorporation General Business Corporation | Form Corp 41 is a basic form which must be filed, whether by mail or online, to the Missouri Secretary of State. This represents the minimum information that must be reported regarding every for-profit corporation being formed then registered to operate as such in the State of Missouri. When submitting the information contained within the Missouri Articles of Incorporation For General Business Corporation, you will need to also submit the Filing Fee. This will be $58.00 so long as the total number of shares being issued does not exceed 30,000 and the total worth of those shares is less than $30,000. If either of these conditions are not met the Filing Fee will be $55.00 for the first $30,000 of shares plus an additional $5.00 for every $10,000 of authorized shares. Add three dollars to this number. This will be the Filing Fee if either condition is not satisfied. The Missouri Articles of Incorporation for General Business Corporation may be downloaded as a form then mailed or it may be filled out online and submitted electronically. If submitting by mail pay the Filing Fee in full with a check made payable to “Director of Revenue.” You will need to pay by credit card or with an account if filing electronically (you must have a login account with the Missouri Secretary of State to submit online). If filing by mail, send to Secretary of State, Corporations Division, P.O. Box 778/600 W. Main Street, Rm 322, Jefferson City, MO 65102. If filing electronically, obtain a login and sign into https://bsd.sos.mo.gov/LoginWelcome.aspx?lobID=1&ReturnURL=~/BusinessEntity/NewBEFiling.aspx?beID=3175573%26FilingTypeID%3d1844. Step 1 - Download the Missouri Articles of Incorporation General Business Corporation from the link above (“Download Form”) or by clicking here: Form Corp 41. You may use a PDF program to fill it out on screen or you may print it then fill it out. If, while filling these articles out, there is not enough room you may attach a properly labeled document continuing the information that must be reported for that article. Step 2 - In Article One, enter the Full Name of the corporation being formed, including corporate designations such as Corporation, Incorporated, Corp., or Inc. Step 3 - In Article Two, enter the Full Name of the Registered Agent on the space provided after the words “The registered agent’s name is.” Below this, enter the Physical Address of the Registered Agent’s Office in Missouri. This should consist of the Street Address, City, State, and Zip Code where the Registered Agent may be physically found. 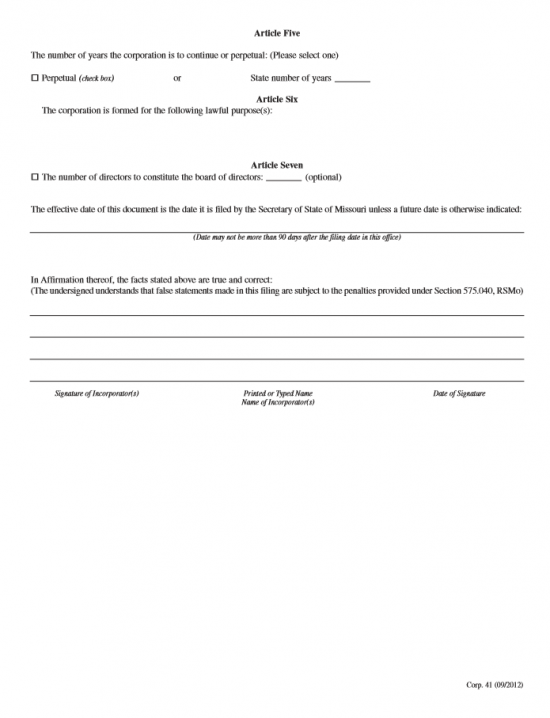 Step 4 - Article Three seeks to define the authorized stock this corporation may issue. There will be two choices and you may only fill out either Section 1 or Section 2. If the total number of shares is less then 30,000 or the par value is under $30,0000 check the box at the end of the paragraph in Section 1 and continue to the next Article. If this is not the case, then skip Section 1 and report the Number of Shares, Par Value of each share, preferences, qualifications, limitations, restrictions, and special rights (if any) of each class on the blank lines in Section 2. Step 6 - Below Article Four will be a box withe three lines labeled “Name,” “Address,” and “City, State, and Zip Code.” Make sure to enter where the Missouri Secretary of State may either send the Certificate of Corporation or return these articles for correction in this box. It is imperative this Recipient information is up to date and accurate. Step 8 - In Article Six, document the Purpose of this corporation. Step 9 - Article Seven is optional. If there is an initial Board of Directors, place a check in the check box then report the number of Directors on it on the blank line provided. Below this, you may enter an Effective Date that is separate from the Filing Date so long as it is within 90 days of the Filing Date. You may leave this line blank if you wish Corporate Status to be effective upon a successful filing on the Filing Date. Step 10 - The final section provides the binding statement these articles are accurate and a corporation is being formed by the Incorporators. Each Incorporator must provide his/her Signature, Printed Name, and a Date of Signature.